NAVIGATION, BACK UP CAMERA, BLIND SPOT MONITOR. 5.7L V8 ENGINE & 4 BRAND NEW TIRES! IN EXCELLENT CONDITION IS THIS 2016 TOYOTA TUNDRA DOUBLE CAB LIMITED 4WD WITH ONLY 35 THOUSAND MILES. VERY SHARP, AFFORDABLE, TOYOTA QUALITY. ONE OWNER, NON SMOKER, NO ACCIDENTS. CERTIFIED WITH A CLEAN CARFAX. ALSO EQUIPPED WITH POWER SEAT, LEATHER SEATING, HEATED SEATS, FOG LAMPS, BLUETOOTH, POWER WINDOWS & LOCKS, TILT, CRUISE, PREMIUM SOUND, RUNNING BOARDS, ALLOY WHEELS, KEYLESS ENTRY. FULLY INSPECTED AND SERVICED BY CERTIFIED MECHANICS, DETAILED AND IS READY TO GO. 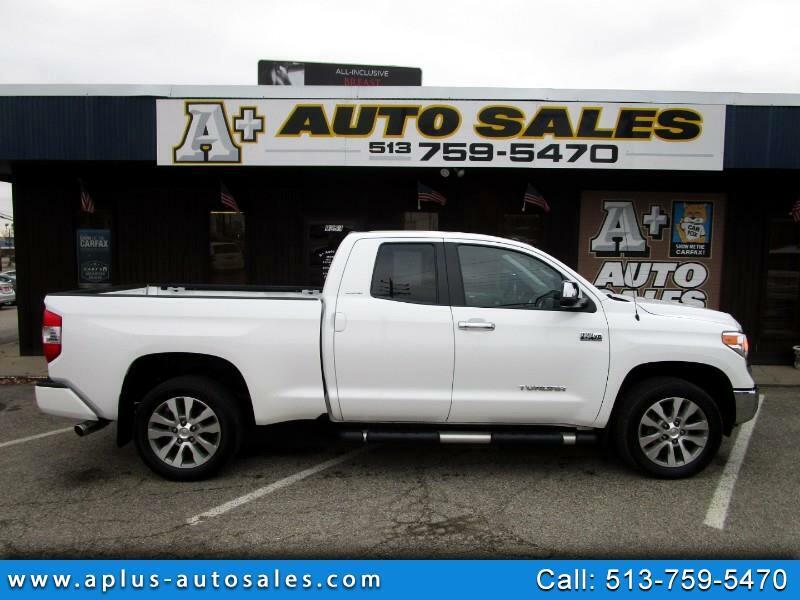 THIS TOYOTA TUNDRA QUALIFIES FOR A 4.24% LOW RATE FINANCING WITH APPROVED CREDIT AND ALSO QUALIFIES FOR A 6 YEAR BUMPER TO BUMPER SERVICE CONTRACT. TRADE INS ARE WELCOME. VISIT US AT WWW.APLUS-AUTOSALES.COM FOR MORE INFORMATION, PHOTOS AND A FREE COPY OF THE CARFAX. (MAY OR MAY NOT HAVE) Due to the limited search capabilities of several inventory listing companies, we feel compelled to tell you that we are able to add options to our current inventory. Or find a vehicle of like Make/Model with the following options: DVD Player, Leather Seats, Power Mirrors, Sunroof, CD Player, Lift Kit, Rear Window Defroster, Tilt/Telescope Steering Wheel, Cruise Control, Heated Seats, Navigation, Side Airbags, and Luggage Racks.